September 10, 2010 (Kearny, NJ) On the eve of September 11th, two articles struck us as reminders of how government officials continue to allow dangerous conditions to exist despite clear evidence that measures must be taken to prevent a potential tragedy. KOTW, once again, calls upon our elected official to retrofit the Kuehne Chemical plant in South Kearny to avoid a potential tragedy. In San Bruno, California gas company officials ignored complaints from residents who smelled an increased natural gas smell in their neighborhood. Local government officials did not take neighborhood resident complaints seriously. The result a gas explosion as a result of a 30 inch natural gas main failure. The main dated back to 1948. Company and Government officials are going to investigate. Wouldn't it have been much more productive to take seriously the natural gas smell complaints by residents and found the leak before it reduced an entire neighborhood into rubble and killed at least four residents? Yes. Just as it makes total sense to retrofit the Kuehne Chemical Plant now before a potential tragedy occurs. August 18, 2010 (Kearny, NJ) The Newark Star Ledger Editorial Board has joined KOTW in its call to retrofit the Kuehne Chemical Plant located in South Kearny, New Jersey. In an editorial piece entitled "Clear and present danger: Lautenberg bill aims to safeguard chemical plants" published in the July 27, 2010 edition of the Star Ledger, the Editorial Board points out referring to the Kuehne Chemical plant, "If an enterprising terrorist were to launch an explosive from the Pulaski Skyway to a chemical plant below, 12 million people could be at risk of death or injury." KOTW has dedicated several articles on the safety issues surrounding the Kuehne Chemical plant which are available on our Environment Page. January 30, 2010 (Harrison, NJ) In the background of the new Red Bulls Stadium one can see white smoke coming from a smoke stack. The smoke stack is the Covanta Energy Ironbound Garbage Incinerator. The incinerator operates 24 hours a day 7 days a week burning garbage from New York City, 22 towns in Essex County and 11 surrounding trash transfer stations. Although garbage trucks were suppose to take the New Jersey Turnpike to access the incinerator, garbage trucks have made their way to the incinerator by taking a short cut through Harrison and through the Ironbound section of Newark. Since its proposal, community activists in the Ironbound Section of Newark have complained that the incinerator posed a health risk to its surrounding community. Their complaints have not resulted in the closure of the plant but have resulted in some emission improvements. When the plant did not have enough garbage to burn it turned to importing garbage from New York City and other communities outside Essex County. As KOTW has suggested previously and as Greenpeace has once again pointed out in its report, the Kuehne Chemical needs to convert its plant to eliminate the storage of high quantities of chlorine by having on site generation of smaller quantities of chlorine gas on a just in time basis. In its report Greenpeace suggests that Kuehne Chemical can follow other industry leaders in converting without the use of government funding. KOTW previously suggested that Kuehne be given a low interest loan to secure its South Kearny facility by converting to a "just in time" facility. The technology is available that would secure the safety of 12 million residents of the New York/New Jersey metropolitan area. January 19, 2006 (Kearny, NJ). Jonathan Dienst of WNBC-TV recently reported on security at chemical plants in Essex County. Parts of the report appeared to show the outside of the Kuehne Chemical Plant in South Kearny. What Jonathan Dienst discovered is old news. 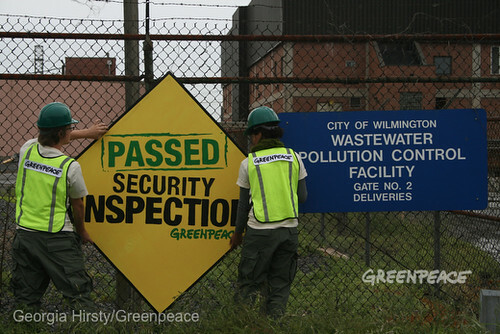 The lack of security at New Jersey's chemical plants has been known for years. What is shocking is that nobody has made chemical plant security a major priority. Governor Jon Corzine stated in the WNBC report that "It's time for the public to get angry" and that Jonathan Dienst's highlighting of the problem was an act in the public interest. Jon Corzine has been at the forefront of trying to get the chemical industry to tighten its security. He had very little success at the federal level at accomplishing that. (See our Environmental Page to links on his efforts).